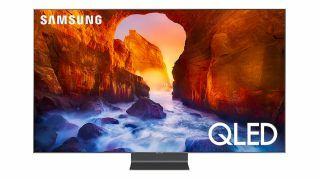 Samsung reveals 2019 4K QLED TV line-up with AirPlay 2 | What Hi-Fi? At the start of the year we got thoroughly hands-on with Samsung’s then-unnamed flagship 2019 4K QLED TV, concluding that it ‘could well be an OLED-beater’ thanks to improved backlighting, viewing angles and colour vibrancy over the 2018-headlining QF9N. It’s only now, however, that we have model names for the 2019 4K flagship – the Q90R (pictured top) – as well as for the rest of the forthcoming QLED line-up. Samsung’s US site currently details four models across three ranges: the 65in ($1799.99) and 55in ($1199.99) Q60R, the 65in Q70R ($2199.99) and the 65in Q90R ($3499.99), however the 2019 line-up ranges between 43in and 82ins, and features a Q80R range too. In total there will be 18 4K QLED models sitting below the company's five 8K QLED TVs: 65in, 75in and 82in Q90R; 55in, 65in, 75in and 82in Q80R; 49in, 55in, 65in, 75in and 82in Q70R; and 43in, 49in, 55in, 65in, 75in and 82in Q60R. The currently available next-gen Samsung 4K QLED TVs can now be ordered from Samsung US, with shipping beginning in March. UK pricing and availability, as well as any further sizes, will soon follow. So, details. The flagship Q90R, which will replace the Q9FN, utilises what Samsung is calling ‘Direct Full Array 16X’, direct backlighting with the most concentrated LED zones, aimed at improving contrast and brightness control. The Q70R also uses direct full array backlighting - just with less zones. The Q60R, meanwhile, features ‘Ultra Slim Array’. The main criticism of the Q9FN (and QLED as a whole), particularly in comparison to its OLED rivals, is viewing angles, so invariably Samsung is tackling that in its Q90R and Q80R TVs by introducing ‘Ultra Viewing Angle’, engineered to reduce glare and enhance colour for optimal viewing from any angle. The new QLED sets can allegedly produce 100% of the DCI-P3 colour space, while various levels of Quantum HDR technology aim to optimise HDR content. On that note, all Samsung 2019 QLED TVs will feature HDR10+. The 2019 QLED range also introduces FreeSync (VRR) technology, which reduces input lag, with less stuttering, for optimised gaming performance. Game Motion Plus, meanwhile, works to remove motion blur and judder. The Q60R, Q70R and Q90R also feature ‘Ambient Mode’, which essentially allows owners to efficiently display info (such as the time), photos, décor patterns or artwork on the screen when they aren’t watching TV. The screens can even blend into the pattern and colour of the wall it’s attached to or sat in front of, too. They also keep the thin cable connection to a separate One Connect Box that powers the TV and houses the various inputs and outputs. The familiar OneRemote now has Amazon Prime Video and Netflix shortcuts, too. 2019 Samsung Smart TVs will also work with Amazon Alexa and Google Assistant voice assistants as well as Samsung’s own Bixby voice platform. And as we learned at CES last month, Samsung has also struck an exclusive deal with Apple to feature the iTunes Movies and TV Shows app on its 2019 TVs, and equip them with Airplay 2. Samsung seems to have evolved its QLED offering in everything from picture performance to smart offering, then, so the burning question is: could 2019 be the year it finally topples rival OLEDs? Needless to say, we look forward to finding out very soon.